Note: How there is limited dust and watery mess. Or if you'd like... you can bring it to our shop. 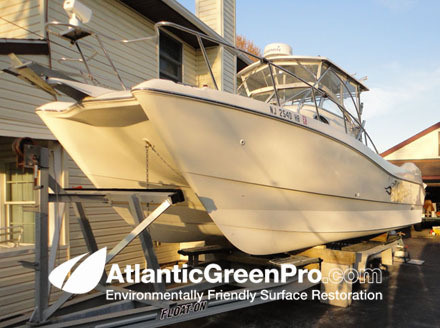 We do a lot of boats as you can see from this small sampling of our work.... we also boat bottom painting if the work is done at our shop in Mt Holly NJ!... 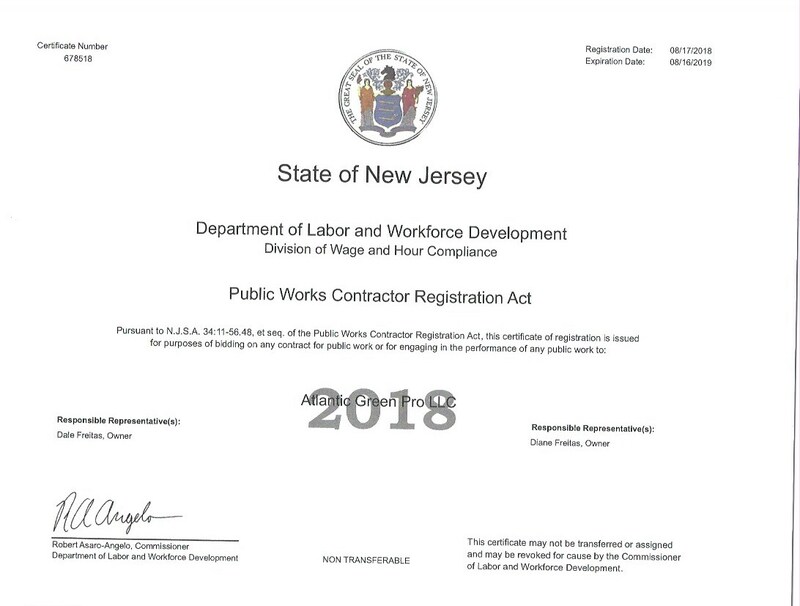 kind of one stop for everything. 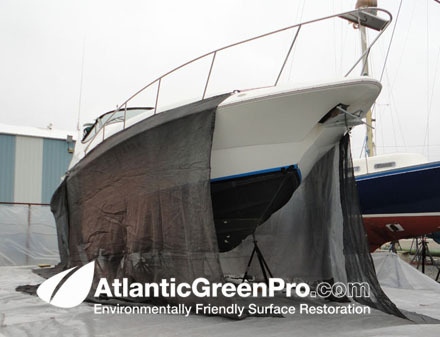 Before: 30' CruserYacht ... here you can see the initial prep including tenting, notice the ground pastic and that nothing get on the ground or on other boats. 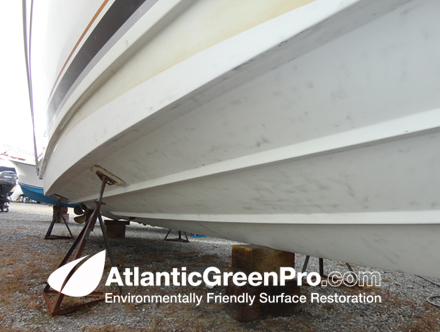 After wet abrasive blasting : 30' CruserYacht ... here you can see the ground is clean and the boat bottom with all of it's old paint removed. 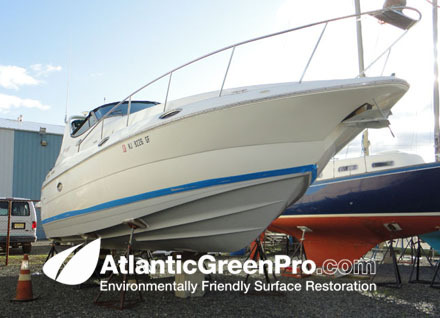 Barrier Coat Epoxy: 30' CruserYacht ... here you can see the same boat with two coats of SeaHawk Tuff Stuff marine epoxy barrier paint. Before: 25' Grady White ... Here's the finished product, with two coats of SeaHawk Cukote hard multi seasonal ablative paint over two coats of SeaHawk Tuff-Stuff epoxy barrier coat. 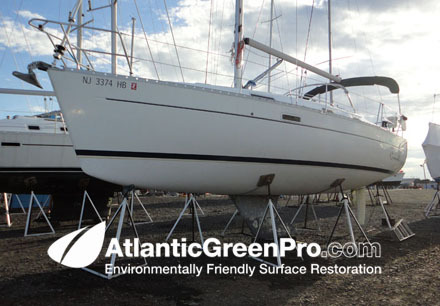 Before: 48' Cherbini Sailboat Amazing Grace ... 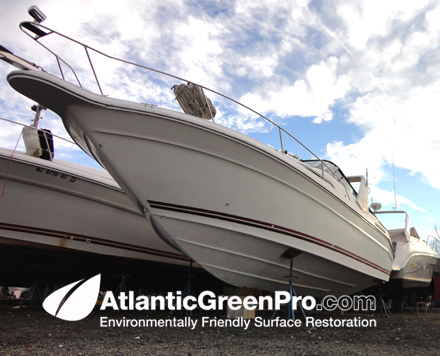 Here's one we did for Cherbini Yachts in Riverside New Jersey, the boat is the Amazing Grace and it was wet abrasive blasted... Note how there is very little if any dust. 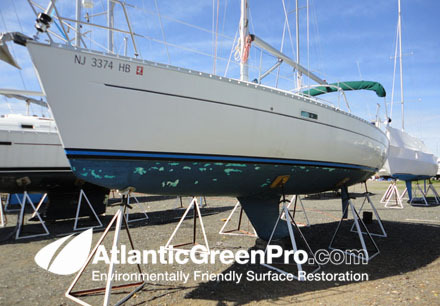 After: 48' Cherbini Sailboat Amazing Grace ... 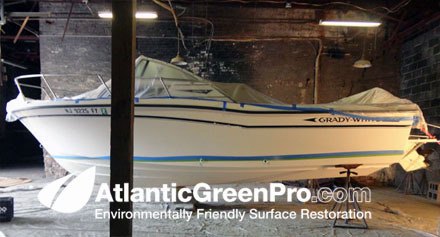 Here's the Amazing Grace finished, note the black gel-coat bottom.... real sweet boat! 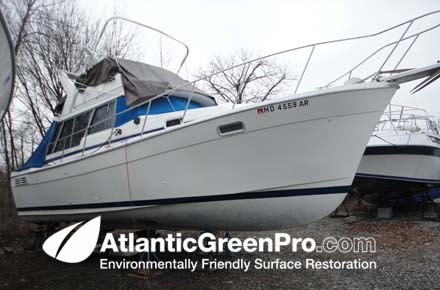 After: 36' Sailboat... 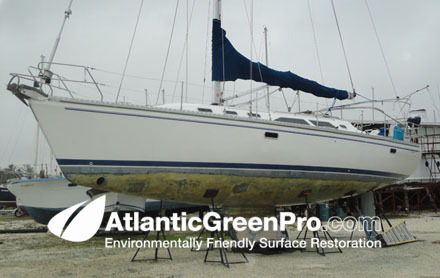 Here's the same a 36' sailboat after we removed the bottom paint... note how clean the bottom is. Before: 25' Catamaran ... Here's she is on trailer and in driveway before we wet abrasive blasted it. After: 25' Catamaran ... 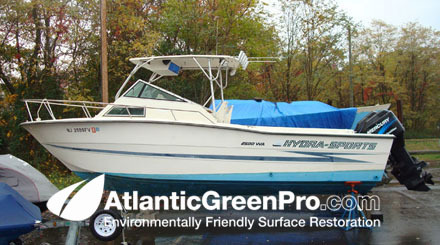 Here's the finished boat again note how clean the bottom is. 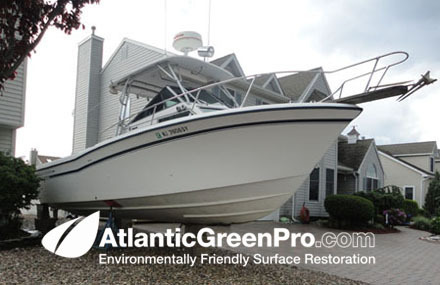 Before: 25' Grady White ... Notice the zero property line, Atlantic Green Pro works in tight spaces and keeps everyone happy... including your neighbors. After: 25' Grady White ... You're not going to find a cleaner bottom. Before: 25' Proline... this job was started by a soda blaster who didn't properly. tent things off... Soad was on everything including the motorhome next to the boat. 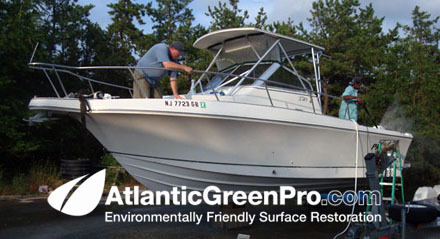 Atlantic Green Pro was brought in to finish the job with our dust free Farrow System. 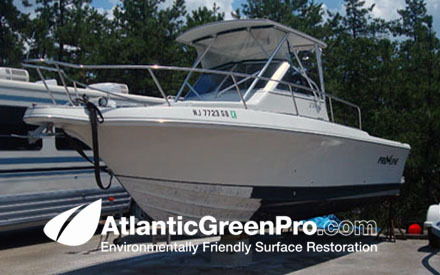 After: 25' Proline... notice how nice the front area of the boat was cleaned up which was soda blasted. 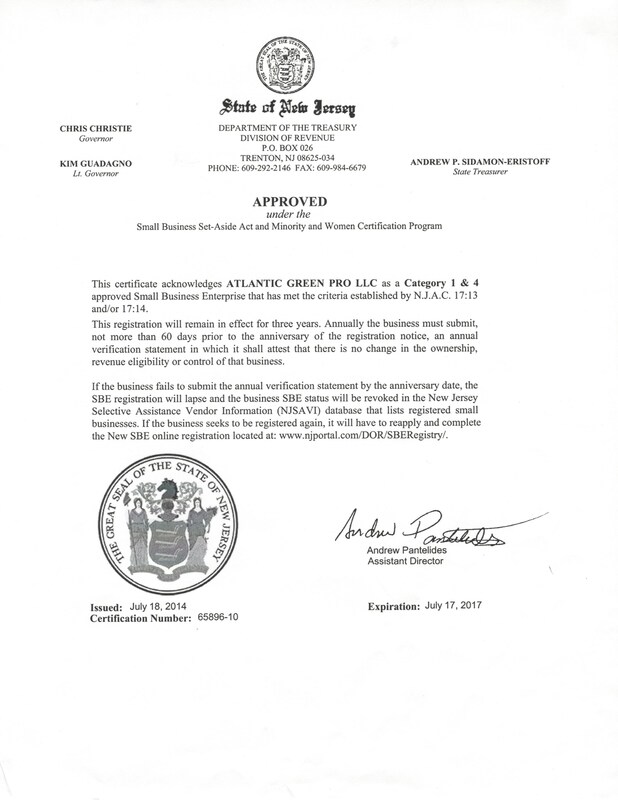 Atlantic Green Pro did the entire bottom... 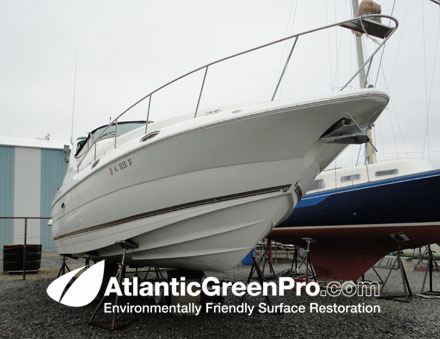 The guys on top of the boat were trying to pressure wash and scrub off the soda which was now embeded to the gelcoat from the wet dew the night before. Before: 33' Grady White... This bottom was a mess and we cleaned it it real nice for the client... Nice Grady! 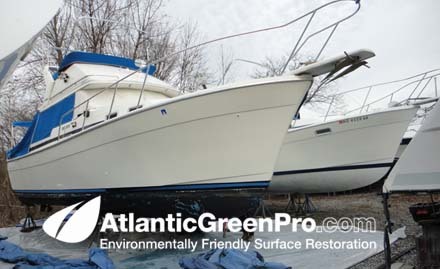 Before: 25' Hydra Sports during our wet abrasive blasting process in a boat yard... note NO DUST and very LITTLE WATER... just the cleanest boat bottoms in the business! 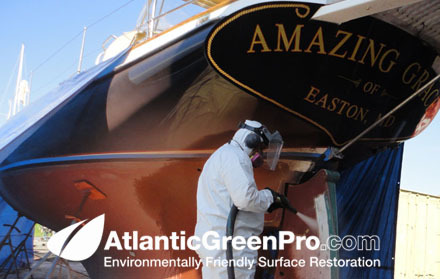 required the anti fouling paint to be removed leaving just the Epoxy paint. 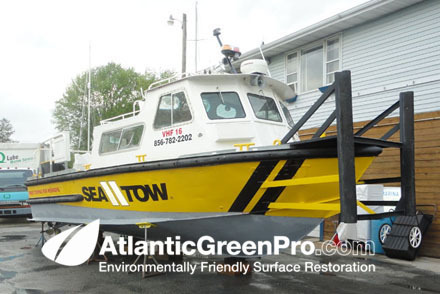 After: 33’ aluminum utility boat This what the SeaTow boat looked like after we wet abrasive blasted it. The client wanted a clean bottom for inspection. 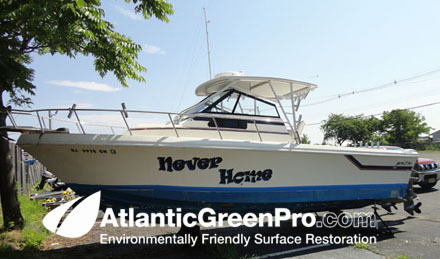 Before: 25’ Hydra Sports for Delaware River Tow Boat U.S. 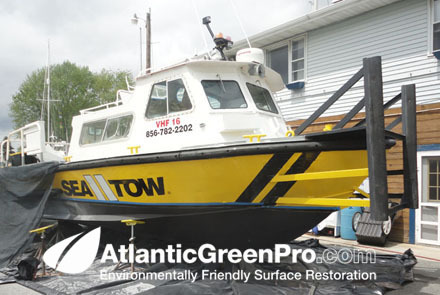 This boat was being converted into one of Tow Boat U.S. work boats. 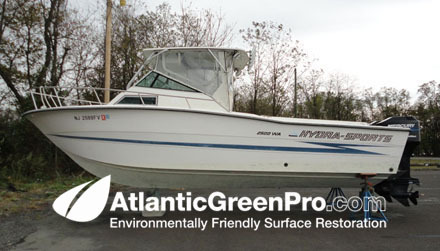 After: 25’ Hydra Sports this was the bottom of the Tow Boat US Hydra Sports looked like all cleaned up and ready for paint. 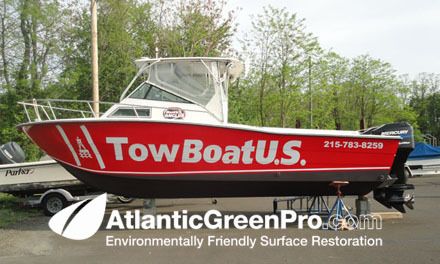 After: 25’ Hydra Sports this was the same boat with NEW Tow Boat US graphics and ready to join the fleet on the Delaware river. 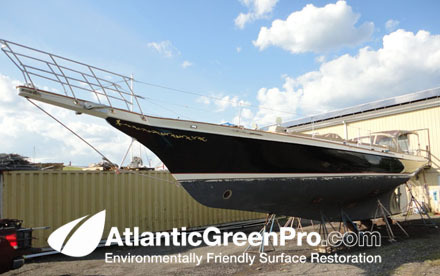 Before: 25’ Proline that we removed the bottom paint from. 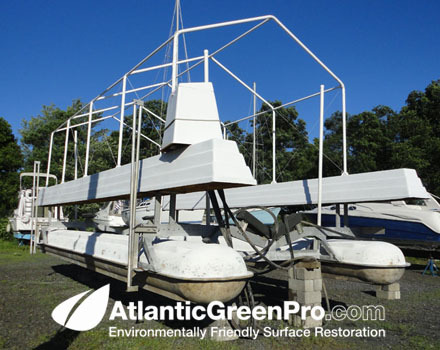 After: 40’ pontoon boat lift all cleaned up and ready for fiberglass repairs. 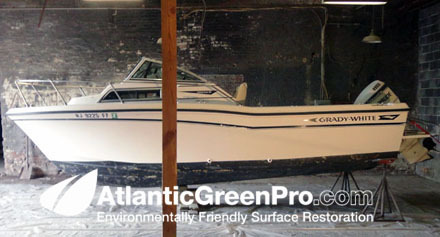 Step 2: This is the same 20' Grady White right after we removed the old paint. 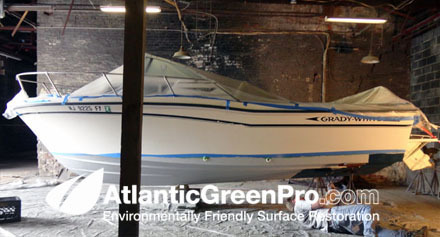 Step 3: The same 20’ Grady White With NEW EPOXY paint. 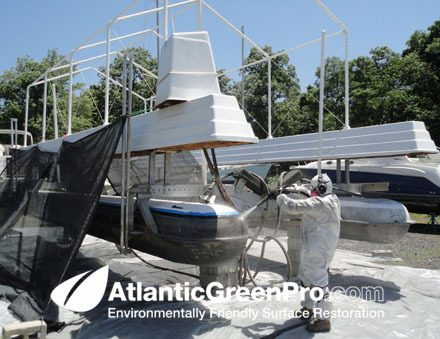 Before: 21’ Aqua Sport getting the DUST FREE web abrasive blasting process in our clients back yard. Note NO DUST and VERY LITTLE WATER! 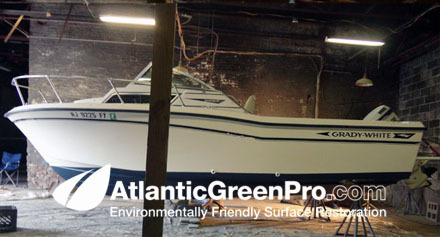 After: 21’ Aqua Sport all done and ready for paint. 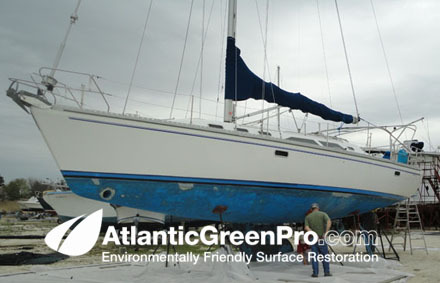 Before: 40’ Catalina Yes we do sailboats too... this was a Florida boat that our client purchased down their and moved up north. 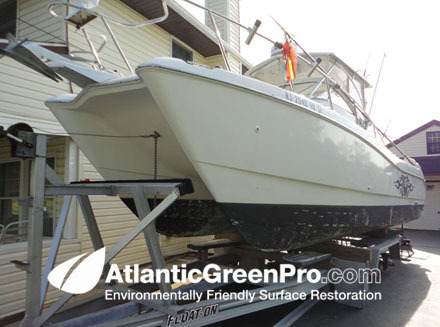 Atlantic Green Pro test blasted the water line exposing extensive fiberglass work from the previous owner. 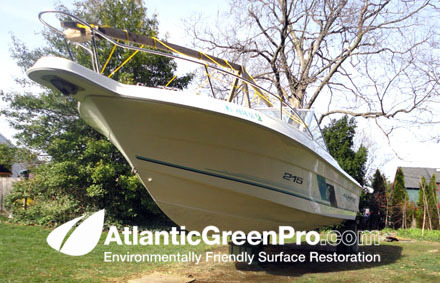 After: 40’ Catalina this is what was exposed after we removed the paint. 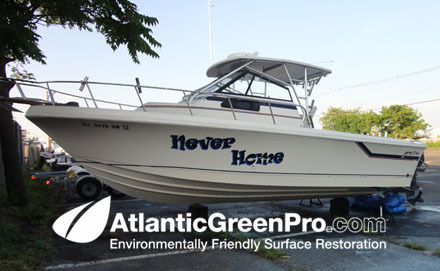 If you're a marine surveyor this is a good reason to hire Atlantic Green Pro. 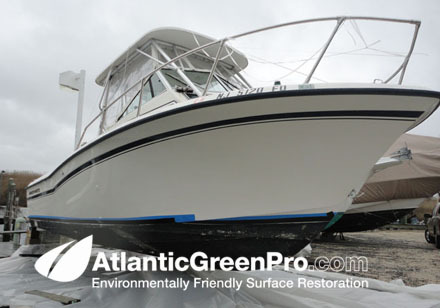 Removing bottom paint gives you better understanding on just what condition the the boats bottom is really in. 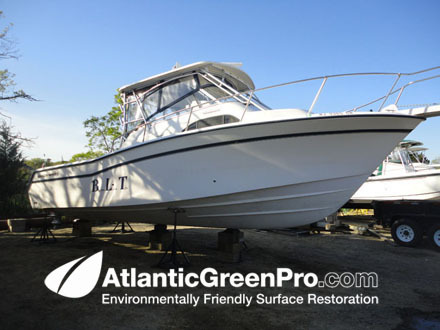 Before: 25' Bimini This was a nice 25' footer we recently did it had twin diesels. A big boat that I under estimated... Any way it was a nice boat!. 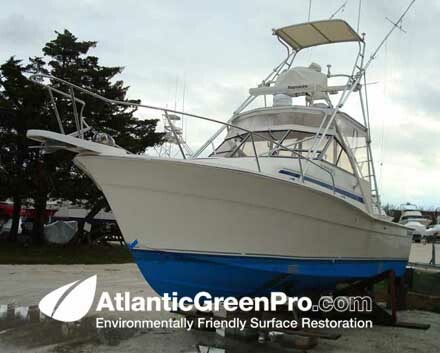 After: 25' Bimini All cleaned up and ready to be worked on and painted. 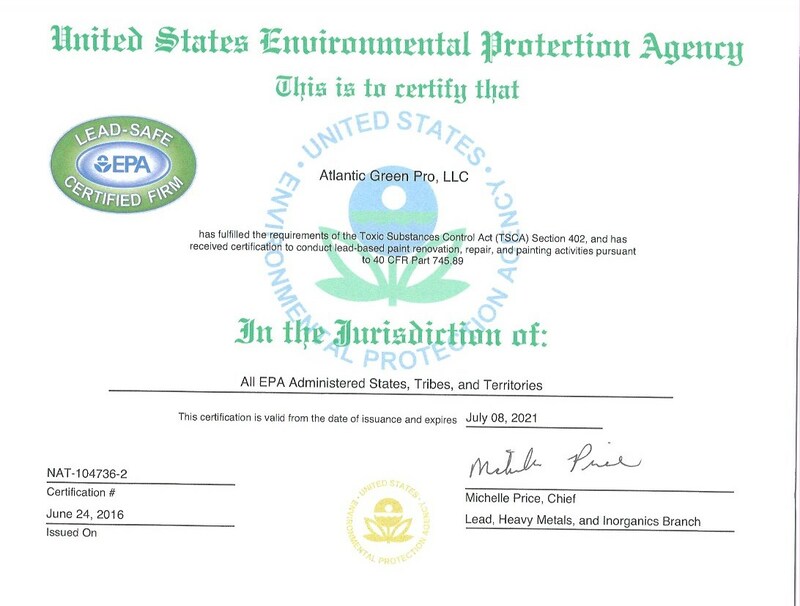 in a very environmentally sensitive area. 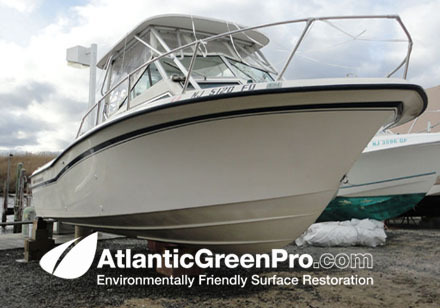 like to believe we do the cleanest boat bottoms in the business. 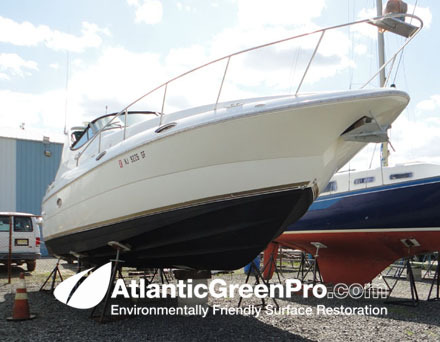 After: 32' Carver This is a recent boat we did on Asphalt and as you can see the boat bottom is super clean and there is no mess on the ground. 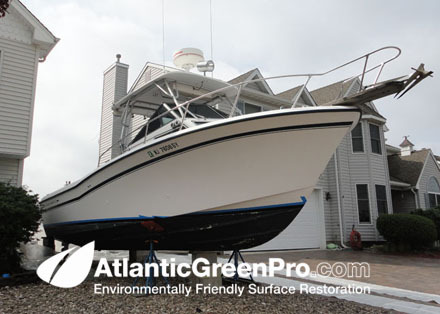 After: 40' Formula another recent boat we did. 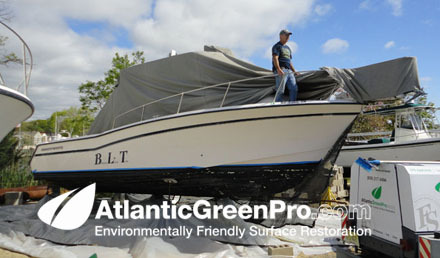 After: 40' Formula same boat as above, just a close up of what to expect. 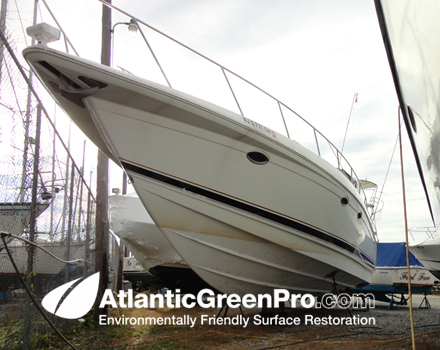 After: 28' SeaRay another recent boat we did. 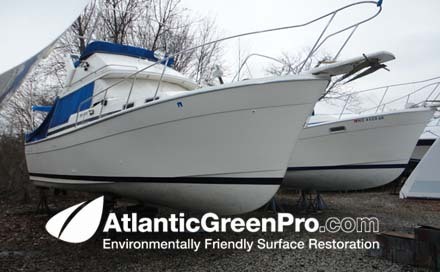 Pair of 32'Bayliners : The one on the right is the one we just did and thye one on the left is the one we are just getting ready to do. 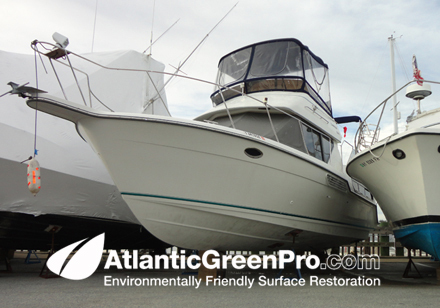 Pair of 32'Bayliners : This is an after photo of both 32' Bayliners after we wet abrasive blasted them. 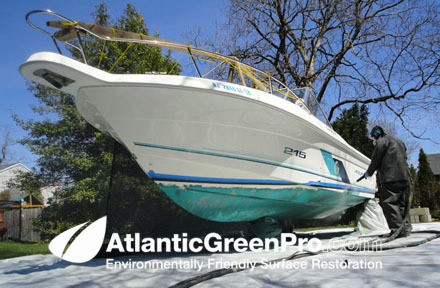 32'Bayliners : This is the first of two 32' Bayliners after we wet abrasive blasted it. 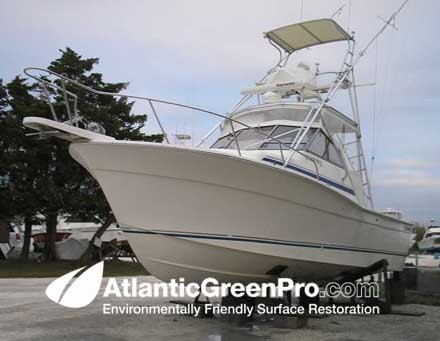 Note how clean the boat and the ground is.